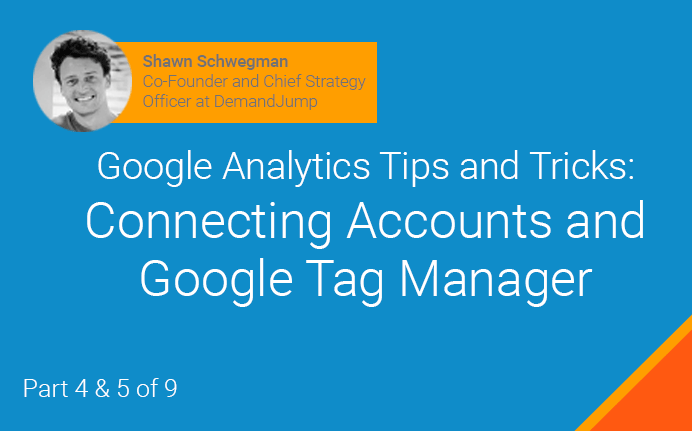 Last week, we released parts 2 and 3 of our 9 part Google Analytics series with DemandJump Co-Founder and Chief Strategy Officer, Shawn Schwegman. This week, we’ll be discussing Connecting Accounts (part 4) and Google Tag Manager (part 5). The primary goal of this series is learning how to use Google analytics more effectively. One feature, which allows for users to maximize productivity, is the ability of Google Analytics to connect other Google accounts such as AdWords, as well as third-party accounts. The popular Google Tag Manager (part 5) is a feature inside Google Analytics which allows for website codes to be updated with ease. When properly configured, Tag Manager allows for less developer involvement after the initial set-up, resulting in more overall productivity, greater marketer control, and the best possible digital experience for customers. Using these key Google Analytics features allows for marketers to maximize both productivity and insight into actionable data. Check out the latest videos above and be sure to check back next week for the 6th and 7th installment of this series. ¹Dane, Jonathan. "Linking AdWords to Analytics: A Guide to Using Google AdWords & Analytics Together." Link AdWords to Analytics: How to Link Google AdWords & Analytics. Word Stream, 6 Aug. 2013. Web. 15 June 2016.